This is my world, this is your world. What kind of world do you want it to be? At Ukutula the conservation philosophy has been centred around the contributions of many international animal loving volunteers for more than a decade. 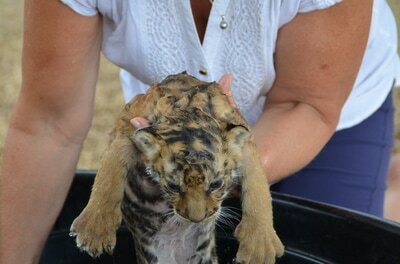 The conservation of almost a hundred animals is an immense task. It takes many hands to accomplish the daily routines. The noble accomplishments have required a sacrifice of resources and time. Many of the volunteers have returned multiple times. At the end of September, 2016 a useful article entitled "Voluntourism: Are you really making a difference?" was published on the web. Written by Lisa Witepski, the article highlighted the importance of making sure that you are participating in a program that is helping, rather than hurting the conservation of the species. This is particularly important after the recent production Blood Lions revealed that unscrupulous volunteer recruitment breeding operators were conducting activities that had very little to do with conservation. We address this issue further under our "faq" section. ​Much has been said recently, decrying the interaction of volunteers with animals as well. Interestingly, in the article, David Youldon, director of the African Lion and Environment Research Trust (Alert) says that there are many times when interaction is not only unavoidable, but necessary. He recognizes too that there are entirely valid reasons to ensure that animal interactions are in the best interests of the animals. As a volunteer at Ukutula, your "volunteerism" and animal interaction is backed by the "entirely valid reason" of documented science, unlike any other program in Africa. You also have the added assurance of a research program that ensures that none of the animals you will take care of is bred for the bullet - ethical volunteering as it should be! 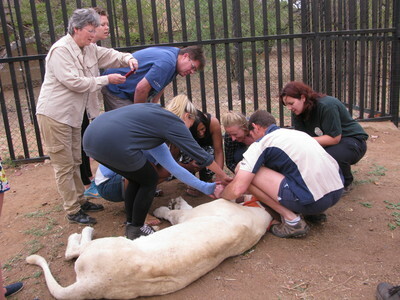 Other pivotal aspects differentiating Ukutula from any other volunteer programs in Africa is the creation of the only privately owned research cryo-biology laboratory on the continent (self-funded with no outside help), thousands of school-children every year that are educated in preserving and not destroying these precious animals, as well as ongoing university veterinary and other education programs, all created to preserve threatened species from extinction. Ukutula also treasures the animals with which they are entrusted - no animal is ever delivered to killers of the animals, whether for hunting or body parts. On the other hand, you should also know that, in their efforts to totally eradicate any efforts to protect endangered species not in alignment with their own vision, activists such as the producers of Blood Lions (the documentary), have made destructive and false claims based on lies. You as a potential volunteer have the precious privilege of choice based on fact and evidence, supported by scientific research. The discerning volunteer is weary of a social media that attempts to sway minds away from a unique captive animal breeding program such as Ukutula. Instead they focus only on emotional trivial inaccuracies as well as generalities, but avoid any reference to the powerful positive results. Volunteers contribute to the health and safety of the animals in pursuit of ongoing research. I volunteer because I always want to learn something new" Jane S.
I volunteer to learn something new or to acquire a skill that I lacked. I couldn’t go out and get a job to learn that skill, but I could volunteer and learn it" Pam M.
good question - who can volunteer? Anybody that has a "sponge-like" quality, is in reasonable health and is between the age of 18 and 70. It is vital that you have a good understanding of English - all your instructions will be delivered in English. Our volunteers come from all walks of life - some are business people and professionals, bankers, accountants, teachers, lawyers, etc. who have used their holidays to volunteer. Generally, these volunteers manage to contribute their time and energy for an average of two weeks. how can i better equip myself? It is wise to consider what courses you could do independently to equip yourself for your placement. Certainly practical would be a first-aid and travel-safety course. Let us know if you have knowledge of where these courses are available in Mexico, South America, Australia, New Zealand and Asian countries! We would love to share the knowledge! This research project is very hands-on, and volunteers will be expected to help with the day-to-day care of all the animals (though nobody is under obligation to do anything they would prefer not to). Care extends to the lions, cheetahs, tigers, caracals, servals, black-footed cat, spotted hyenas, giraffe, ostrich, all the antelope - even a family of meerkats! Best experience ever. Would recommend the walk with lions as it is simply awe inspiring. International Volunteer Day (IVD) on 5 December was designated by the United Nations in 1985 as an international observance day to celebrate the power and potential of volunteerism for the purpose of making the world a better place. What better way in contributing effort toward the preservation of endangered species? Why not celebrate this day (and more) at Ukutula Conservation Center? All volunteers are to communicate and work as a team to ensure a pleasant working environment and experience whilst on the project. It is requested that all behaviour at the bar be orderly. The seriousness of this request is evident from the fact that anybody who is drunk and misbehaves could even be asked to leave the project. It is requested that every volunteer be respectful and sensitive with regard to sexual matters, whether this relates to speech, suggestive clothing, flirting etc. Harassment of any kind is cannot be tolerated. It is also requested that there be no attempt to establish relationships with any staff or guests at Ukutula. An established rule specifies that no volunteer will frequent the staff accommodations and the same applies that no staff member will frequent the accommodations of a volunteer. Volunteers are Ukutula representatives for the duration of their stay and, as such, professional conduct is expected of them. No alcohol or smoking is allowed in the chalets. Use of, or distribution of any form of narcotic is forbidden at Ukutula​​​. Consistent with the value of education at Ukutula, volunteers now also have the option of obtaining the accredited Predators Course offered by the Wildlife Education Foundation and presented on-site at Ukutula Conservation Center. A special price of ZAR 500.00 has been negotiated for Ukutula volunteers. Upon successful completion of the course, each student will receive an official WEF (Wildlife Education Foundation) certificate. ukutula volunteers arrive to work and never want to go home!